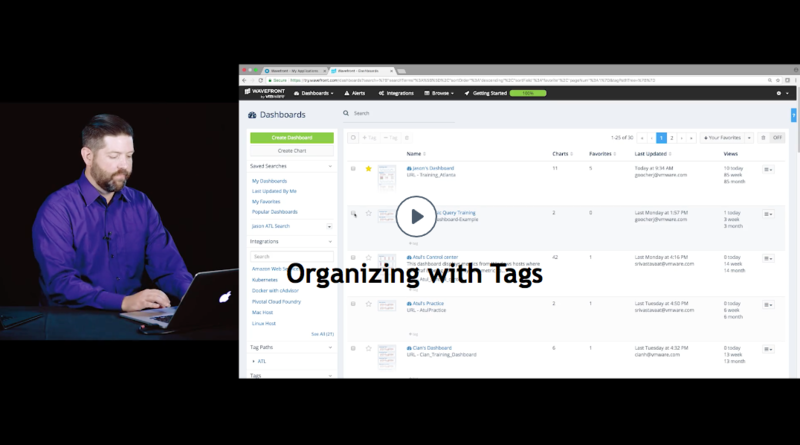 Learn how to use tags to focus and speed up queries display and to unclutter the UI. A tag is custom metadata that adds application-specific meaning to Wavefront objects such alerts, dashboards, events, and sources and metrics. 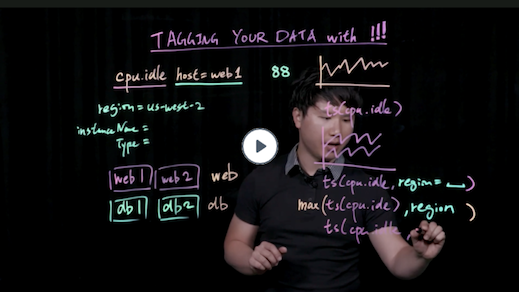 See Wavefront Data Naming for examples of tags and tag naming. Point tags – Add dimensions to your query with point tags. For example, examine only metrics from a certain region. Source tags – Group your sources. For example, examine only production hosts but not development hosts. Note: Information about the source is part of each metric, but you add source tags explicitly from the UI, CLI, or API. Alert tags – Find alerts or to exclude tagged alerts froma maintenance window. Object tags – Limit the number of objects (e.g. dashboards) and metrics. For example, you might display only dashboards with a certain tag. You can use tags to filter alerts, dashboards, events, and sources from the Wavefront UI or with the REST API. source tag Filter sources Add source tags using API, CLI, or UI. Select only tagged sources in your query. alert tag Suppress alerts with alert tags tags during a maintenance window. Create or add alert tags. Reference alert metrics by tag. event tags Filter and find events. Create or add event tags. Use filters in Basic events() Queries. Tags display when you hover your mouse over a line, point, etc. in a chart. Tags display as gray labeled icons in the filter bar and below each object in the browser for that object (e.g. dashboard or alerts browse). Tags on the left of the object browser allow you to filter your display. All tag types support the ability to organize tags in a hierarchy. The hierarchy is defined by separating tag components with a dot “.”. For example: MyService.MyApp. Dashboards provided by Wavefront start with a tilde at the beginning of the tag, for example, ~welcome., ~integration., and ~system.. To improve readability, tags retain case for display but they are treated as case-insensitive for searching, sorting, etc. Select only tutorial dashboards by expanding the wavefront node and selecting wavefront.tutorial. In queries, you achieve the same effect by using trailing wildcards “. *” when you specify tag paths. For example, to match all tags starting with alertTagPath., enter alertTagPath.*. This string matches alerts named alertTagPath.tpc1, alertTagPath.tpc1.tpc11, etc. When you create maintenance windows you can use tag paths and wildcards to put a group of of alerts in maintenance. Object tags apply to Wavefront objects: alerts, dashboards, events, and sources. While every Wavefront user can view Wavefront objects, you must have Alert, Dashboard, Event, or Source Tag Management permission to manage those objects. If you do not have permission, the UI menu selections, buttons, and links you use to perform management tasks are not visible. For some objects, you select Browse > <object>, where <object> is Sources or Events. For other objects, such as Alerts, you click the object. Check the checkboxes next to the object and click the + Tag button. Click + at the bottom and select a tag or click Create New Tag. In the Add Tag dialog, click the Create Tag button at the bottom. Type a tag name. Tag names can contain alphanumeric (a-z, A-Z, 0-9), dash (-), underscore (_), and colon (:) characters. Tag names are case sensitive. For example, the tags MyApp and myapp are stored as distinct tags. However, mixed case tag paths are collapsed into one path; MyService.myapp and myservice.myapp are collapsed into Myservice.myapp. When you have many tags in your environment, you can search for tags by typing tag names in the Search box below the Tags heading in the filter bar on the left. As you type, the list of tags is filtered by the search string. Note When you search for tags, the search process is case insensitive. 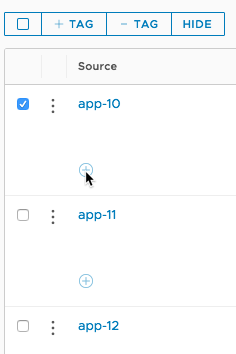 For example, searching for the tag myapp returns MyApp and myapp. To filter by a tag, click a tag icon. You can click the icon in the filter bar on the left or below an object in an object browser.